Nine residents from the Jacksonville Teacher Residency Program completed their residency year this June and were offered placement in Duval County’s transformation region. The teacher residency program, or JTR, is one of the first QEA investments to be implemented and has yielded positive results both in DCPS schools as well as at the University of North Florida, where residents attend courses in the College of Education and Human Resources. 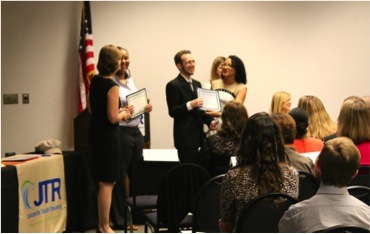 In the summer of 2014, the first cohort of residents began their journey to becoming effective teachers in science and math by taking master’s level coursework at UNF. Most of their courses were taught jointly by UNF faculty and DCPS teachers, in order to give a blend of theory and practice that research has shown results in high-performing teachers. In August of last year, the residents began to work as interns alongside some of the Duval Transformation Office’s best and brightest teachers. Over the course of the school year, the residents worked in their classrooms perfecting the skills of teaching and classroom management, while also taking classes at UNF learning content and subject-based skills. To officially culminate the end of their residency and the beginning of their careers as teachers of record, the JTR program staff and DCPS leadership held a “signing day” on May 26. At the signing day event, Dr. Nikolai Vitti, Superintendent, spoke to the new teachers about his own experience as a new teacher and assured them that they were in for the hardest but most rewarding work in the world. Region Superintendent Iranetta Wright, Dean of the UNF College of Education and Human Resources Marsha Lupi and Duval County School Board members Paula Wright and Connie Hall were also in attendance to give words of wisdom and welcome to the group. “We could not be more proud of this group of individuals. They taught us so much more than we taught them,” said JTR Program Director Chris White from DCPS. Several of the principals of the DTO schools where residents were placed as well as their master teacher mentors joined in the celebration and welcome of their new colleagues in the district.